Hey guys!! How's it going? I can't believe that it's Friday already. Where has the week gone? Goodness! 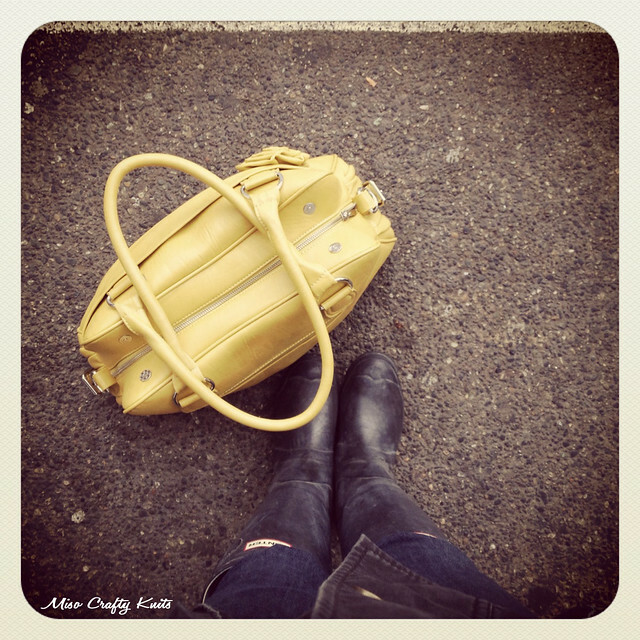 And I haven't blogged once this week, other than to post last week's Project 365 photos. Who knew that going away for 2 days would warrant so much catching up in the home? Laundry had built up (why is it that when you leave your kiddo with Dad that laundry doubles? ), emails in my inbox need to be answered (suddenly there's a surge of interest in my Meela Baby Carrier tutorial), and trying to catch up on all the messages and comments from various social medias (I've most likely missed a bunch of stuff too. The dangers of being connected on too many social media outlets). On top of it all I've been trying to stave off Starteritis. After being at Knit City, I've had this urge to cast on ALL the things. Meh, doesn't help that we've been having quite the craptastic weather here lately too. I'm not complaining though, we've had awesome weather since July to well into October, I kind of welcome the cold and rain. Makes me appreciate my hand knits even more. Although I'm starting to realize that I'm lacking in hand knit socks (ok, not really...but I think I need to add more to my sock drawer), and am definitely in need of some cozy hats and mitts. Anyhoo, I'm totally veering off topic there. 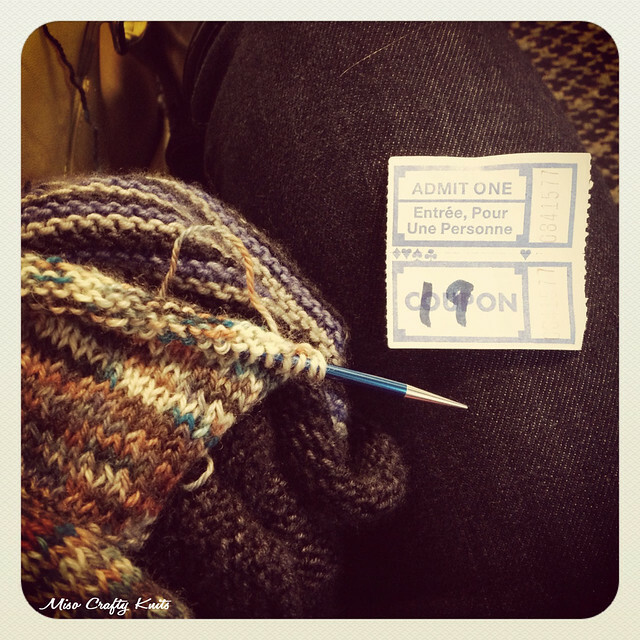 I had wanted to talk about Knit City. I'm sure by now you've all heard and seen photos of just how awesome Knit City was. Amanda and Fiona of Knit Social did an utterly fantastic job of planning and organizing the event. I had SO much fun, and it was great to be able to meet so many new people and turning those online friends into actual friends (Hi Aja! Hi Brie!). I saw so many awesome hand knits (sadly it also got really hot in the venue, I think a lot of people refused to take off those hand knits. I mean, come on! We're at a fibre festival. In a room full of knitters! ), and the entire time I was riding on a yarn fume high. The yarn fumes were definitely strong as once again, even though I had my camera, I totally forgot to take any pictures! I even had my iPhone on hand and even then I think I took maybe 2 photos of the actual event. I got so caught up in trying to catch a glimpse of booths (it was jam-packed in there! ), checking out everyone's hand knits, and chatting that the idea of whipping out my camera just didn't come to me. Until after. Of course! I'm so happy that Knit City got such a huge reception from the knitterly masses and I think the event was quite the success. Before the doors opened there were knitters everywhere. It was pretty awesome. The line up to get in was crazy. 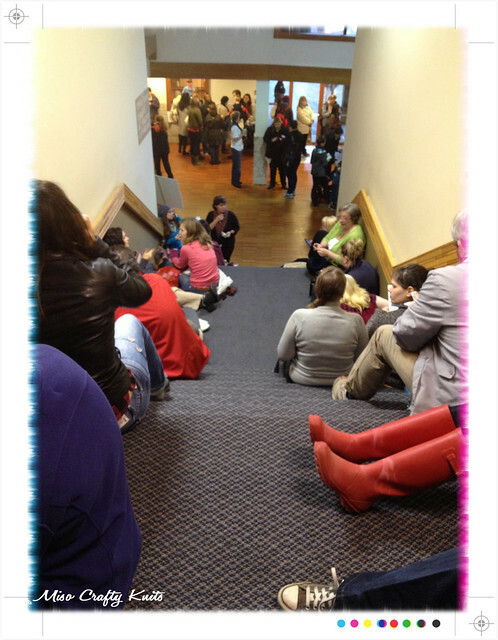 See all those knitters on the stairs in the photo above? Yeah, all in line to score a swag bag - which were handed out to the first 50 people in line for the marketplace on Saturday. I was super lucky that my amazeballs of a friend, Aja, was able to pick me up from the ferry terminal and we were able to be part of that line! Aja and I were 18th and 19th in line! Thank you so much Aja for going out of your way and picking me up! I totally appreciate it!! And thanks for being such an awesome companion all day. ♥ You rock!! Not pictured is the hank and ball of novelty yarn that I had given to my friend Arika. I have no use for novelty yarns and wasn't sure what I was going to do with them so when Arika mentioned that if those yarns were hers, she would weave with them, I promptly gave them to her. Also not pictured is the awesome Knit City canvas tote bag that the swag came in. It's made of thick and sturdy 12oz. cotton canvas, and is massive. It's now the bag I will bring along to knitting related events and for when I hit up Vancouver for day trips. So what's this swag? Yarn samples and minis, a Jane Richmond pattern, a plastic needle gauge/ruler, notepads, stitch markers, blocking pins (which I kept blindly shoving my hand into! 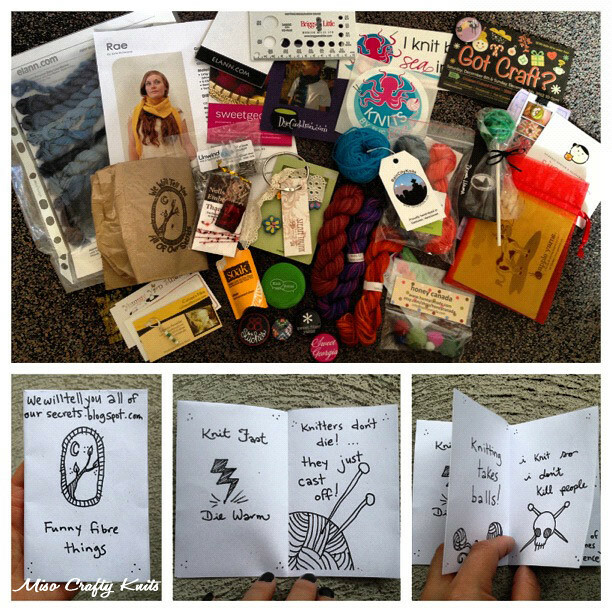 ), buttons and pins, felted balls, business cards with yarn discounts, a SOAK sample, a Knit Social measuring tape, and my most favourite of it all: a super cute handmade booklet from We Will Tell You All Our Secrets! Seriously, how cool is this booklet?? I actually got to meet Caitlin and her husband, the dynamic duo behind We Will Tell You All Our Secrets. They are just the sweetest people ever. I totally developed a girl-crush on Caitlin! I think I might have creeped her out though. Cause to me she's totally a knitting celebrity, and when I meet celebrities and people that I follow via blogs, Twitter, Instagram and the like without actually talking to them, I get overly nervous and quiet, and tend to stand there smiling too much (to the point where I'm no longer smiling, just baring teeth), giggling too much, and say weird things that don't get filtered first (think Baby's "I carried a watermelon" line. That something I would say and then walk away totally disgusted with myself for muttering something so uncool). I think I might have just stood there staring at her. I really hope that wasn't the case, and that I came out of the conversation looking somewhat like a normal human being. Anyhoo, here's my loot. Are you surprised? 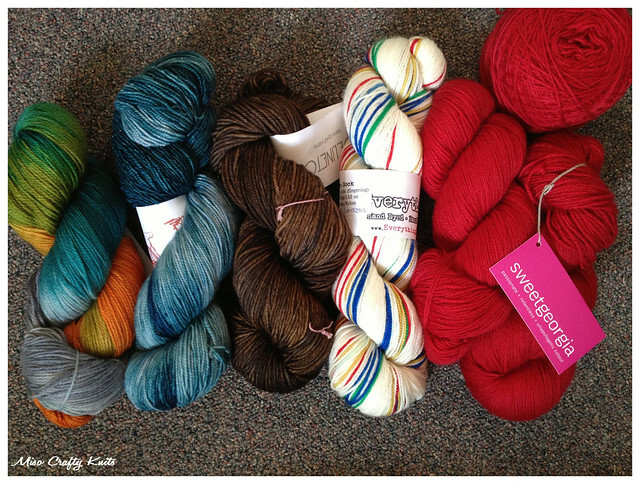 Did you expect to see a photo of nothing but yarn? Would you believe that I actually used some willpower to hold back? Well, that and the lack of funds really helped. From the left: a gorgeous custom dyed for Knit City by SweetGeorgia Yarns (soon to be living with my friend Natalie), a yummy sparkly skein beautifully dyed by Little Reed Bicycle (you can't see the sparkle in this photo), a skein of MadTosh Tosh DK to make Brett a hat with, Everything Old Signature Sock in a Bay Blanket inspired colourway that she only dyes up for knitting events (I can't wait to cast on this yarn!! ), and a sweater's worth of BFL from SweetGeorgia to make Jane Richmond's newest cardigan design from her new book that was pre-released at Knit City called Island...which I had also bought and got signed by Jane herself (and is not pictured. Man, I'm horrible at the picture taking lately, what gives??). I was really hoping to meet Melissa from Sweet Fiber and to see all of her beautiful yarns in person, but sadly due to a medical emergency she was unable to attend. I hope she's ok!! Other than that I was pretty darn excited to see and get introduced to new yarns and indie dyers, to meet the lady behind the Travelling Woman shawl and collection (she's absolutely lovely! ), to check out all the awesome booth layouts, to view in person the new book by TinCan Knits that I wished I could have brought home with me but the aforementioned lack of funds prevented me from doing so, and to just see all the knitters and knits. It was heaven. I wish I could say the travel home the next day was heaven too, but alas, the torrential downpours and public transit made for a very wet and long day. Still, it was worth it. 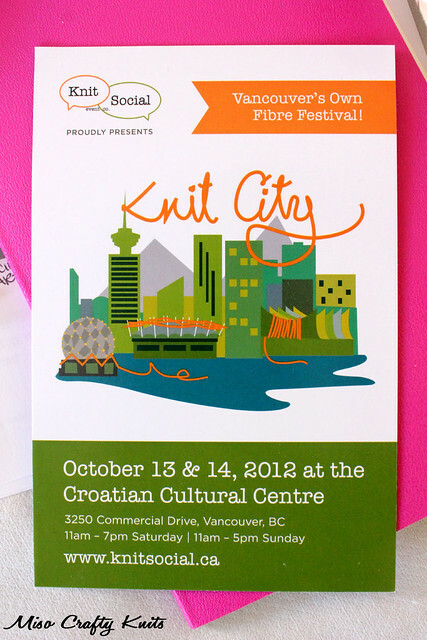 Knit City was a blast and I sooo can't wait for next year!! i'm so jealous of your loot! and going to knit city in general! next year though.. wink wink.. i share that feeling of being too excited to take photos though. you realize i staid with you for five days and i didn't take a single picture of any of you? how crazy is that!! Knit City looked like it was super awesome! Thanks for sharing photos so I could live vicariously through you. Enjoy your goodies! Yay! I feel like I was there ;) Looks like it was a ton of fun! And thanks for snagging me some yarn! Thanks Nat! Hopefully next year we'll be able to go together? It was a fabulous event and I've already put it in my calendar for next year, even though we don't have dates yet! Loved your cardigan, everything about it was lovely. Thanks Fiona! :) I'm sorry I didn't get the chance to talk to you!! Everyone's booth was just so busy (which isn't a bad thing at all!!). Maybe next year? Melissa you bought the same yarn I almost bought (the Everything Old one. I loved it but the budget for new yarn ran out. :) I hope you have fun knitting with it, it looks like it would knit up something interesting.